How to Make Your Building More Accessible - Darmax Inc.
With the advent of the Accessibility for Ontarians with Disabilities Act(AODA) in 2005, the design and functional requirements of commercial and public spaces started to change. Many municipalities have devised Accessibility Plans to phase in the many requirements for making commercial and public spaces more accessible for all patrons. While being mandated to renovate aspects of your building may appear to be a burden, the benefits can far outweigh the hassle. 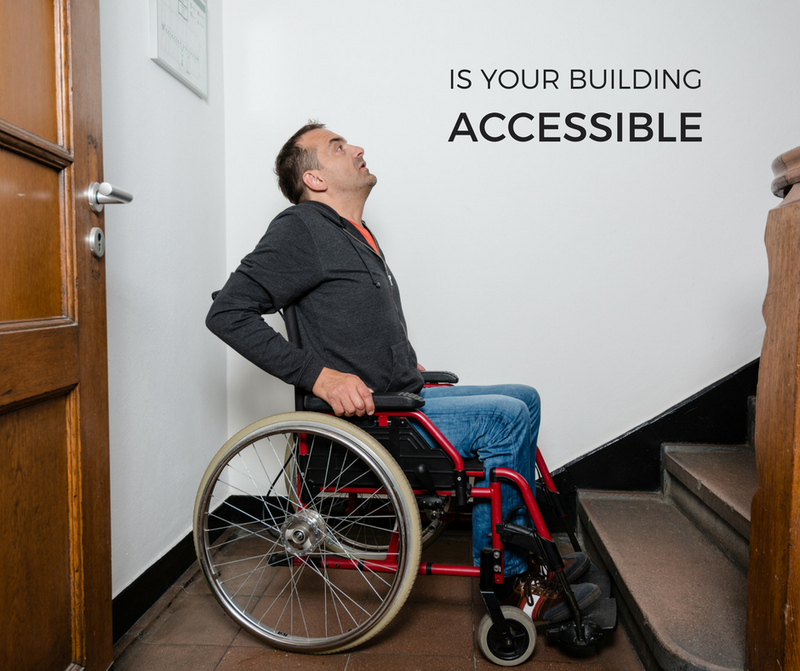 What are the benefits of a more accessible building? More people will be able to access the business(es). If your building is easy to access and navigate within, patrons are more likely to spend more time. Both of the above mentioned benefits can directly affect your bottom line; that’s a BIG benefit! One great way to ensure your building or business is as accessible as possible for your patrons is to engage them in the process. Find out the aspects of your building are “tricky” or hazardous for them to navigate. You may find that there is an aspect that is tricky for your patrons that is not included in your region’s building code. Work with your customers to find reasonable solutions for everyone. Let’s explore a few of the key areas to consider when making your building accessible and some ideas for consideration in each area. Ensure you have at least 1 accessible parking spot for every 25 spaces or less. Spots should be clearly marked, have wider clearance around the vehicle. Accessible parking spots should lead to stair free access to your building. Not all entrances have to be accessible. Entrances that aren’t accessible should clearly direct people to the accessible one(s). When removing stairs to create a ramp, ensure it has as gentle a slope as possible. This might mean a longer ramp is required. If a ramp is not possible due to elevation or space availability, consider the option of a lift. Accessible doorways must be wide enough to accommodate wheelchairs and other mobility devices. The accessible entrance must be easily opened. Some options to create this ease are automatic door openers (either motion or button activated), and Assist Call buttons. If your building has a reception or service counter, consider providing patrons with a lower portion. The lower portion allows staff and patrons to be seen and interact with greater ease. If washroom facilities are required for your establishment, ensure at least one is accessible by wheelchair and other mobility devices. Be sure to make this door easy to operate as well! Keep floor spaces free from obstruction and provide clear lines of sight wherever possible. The last and perhaps most important aspects to accessibility for your building are Your Staff or Tenants. Train your staff to assist patrons when needed in a way that is respectful and maintains the dignity of all involved. While you likely can’t enforce training for your tenants, you certainly can encourage them to maintain “access friendly” spaces and procedures. Creating accessible environments isn’t just about meeting the requirements laid out by some law or building code; it’s about creating an inviting, productive environment for all. In order to avoid costly “corrections,” be sure to consult your local Building Code or Planning Department to ensure any changes you make will satisfy the AODA or equivalent Accessibility Regulations.